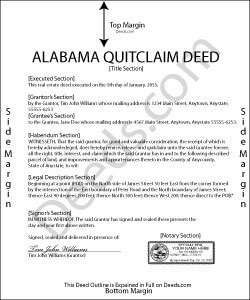 For a quit claim deed form to be valid in Alabama, it must meet specific statutory requirements. The conveyance must be in writing on paper or parchment, and signed or marked by the grantor or an authorized agent and must also include the name, address, and marital status of the grantor (Ala. Code 35-4-20 et al). If the grantor is married, but the property is only owned by the spouse transferring ownership, the grantor's signature alone is sufficient for a legal conveyance. However, both spouses must sign the document if the land conveyed includes designated homestead property, regardless of the other spouse's ownership status. Non-homestead transfers require a recital stating that the property conveyed is not the grantor's homestead. In addition, deeds must contain a complete legal description of the property; a reference to prior recording if available; the grantee's name, address, and vesting information; a statement identifying the name and address of the individual who prepared the deed (Ala. Code 35-4-110, 113); and a witness statement or acknowledgement by a notary or other individual authorized to take oaths. If the grantor can write, the acknowledgement is sufficient, but if the grantor cannot write, an additional witness is required. NOTE: because Alabama quitclaim deeds offer no warranty of title, the warranty clause section of the deed should not include the words "grant," "bargain," or "sell," because they contain implied warranties (Ala. Code 35-4-271). Instead, it should read "quit claim and convey," "remise, release and quit claim," or other such language that clearly shows the grantor's intent to convey his or her interest in the real property, but nothing more. By law, any document conveying ownership in real property must be recorded with the probate judge in the county wherein the land is situated (Ala. Code 35-4-50). Recording is important because it enters the transaction into the public record, which provides formal notice of the change of title, protects the most recent owner, and preserves the clear chain of title. If a conflict about ownership of property arises, a later owner who recorded a conveyance will triumph over an earlier owner with an unrecorded document. Moreover, a clear chain of title makes it easier to re-convey the property at a later time. The statutes specifically state that there is no requirement to recite the actual consideration paid in the text of the deed (Ala. Code 35-4-34). However, as of August 1, 2012, Alabama enacted Ala. Act 2012-494. This requires disclosure of the actual purchase price of the property or the actual value of the transfer, using the Real Estate Sales Validation Form, in accordance with Ala. Code 40-22-1. No deed may be recorded without submitting the form and paying the associated tax. Be aware that counties often require unique formatting, additional information, tax forms, or other documents before the quit claim deed may qualify for recording.